Richard Camp has provided by business and myself with outstanding service for over ten years. Most notably, Richard was able to negotiate a very complex and time comsuming Offer in Compromise agreement with the Internal Revenue Service on my behalf, during which he accompanied me to a face to face meeting with the I.R.S. 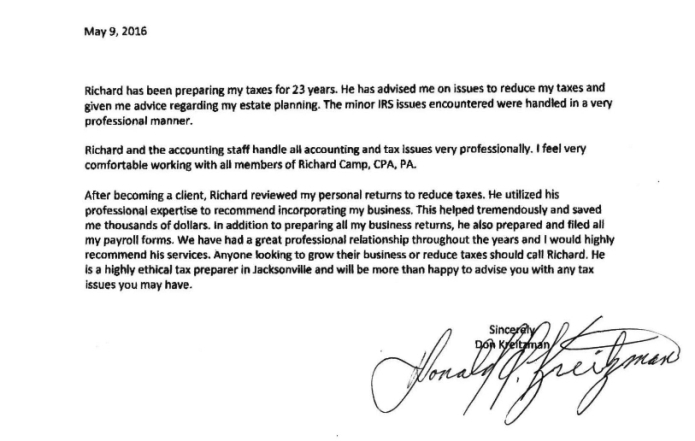 and with Richard's experience and negotiating skills, we were able to achieve an agreement which resulted in a substantial reduction in taxes. Richard also incorporated my small business, making sure that everything is now filed properly and remains in compliance with the I.R.S. and the State of Florida. He has done so much to help me over the years that I do not know what I would have done without his services. I find him to be genuinely concerned about more than just the numbers. He is a very friendly and and all around good man and comes highly recommended by me. "Richard and his staff are very proud professional and punctual. I've been using them for 20 years. Top notch and highly recommended!!" 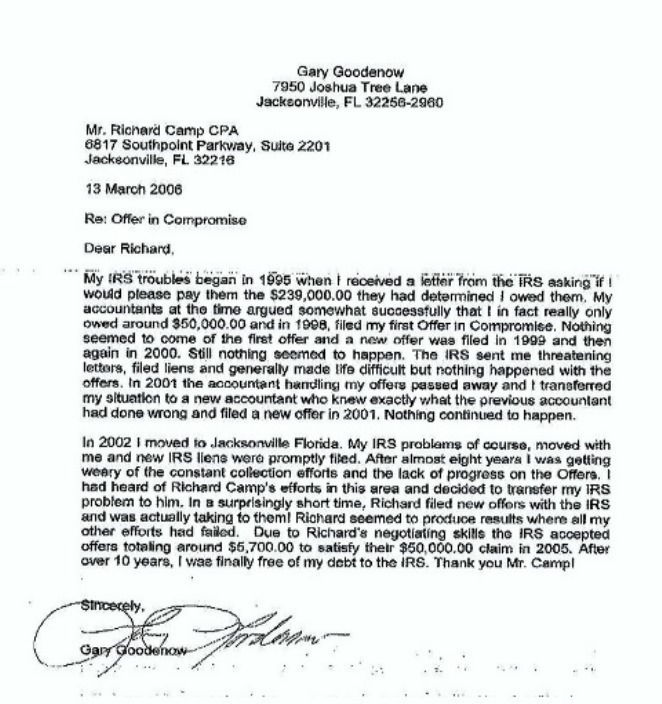 "Richard has been my accountant since I moved to the Jacksonville area in 1997. He has been with me every step of the way as my career and business grew. His business guidance and advice have been invaluable and his accounting skill has made that part of my life much easier to manage. I will always be grateful to Richard and his team for all their help!"